The HTC Inspire 4G might be a budget phone, but it's far from uninspiring. Inspired or just plain insipid? After using the HTC Inspire 4G for a bit of time, we found it to be aptly named. For a budget handset, it often performed better than more expensive smartphones, even from the same manufacturer. HTC are masters of cooking up a variety of subtly different smartphone designs, serving them up hot, fresh and customized to each carrier. One of the more affordable of these is the HTC Inspire 4G, an AT&T-branded variation of the Euro-centric HTC Desire HD, which we first reviewed back in April, 2011. Unfortunately for the U.S. variant, Android hasn't been standing still during that time – we've seen a veritable army of new handsets parade before us in the last 10 months, not to mention the debut of Android 4.0 Ice Cream Sandwich. Can the 4G-friendly American model still conjure up enough inspiration to satisfy? Like other HTC smartphones, the Inspire 4G is mostly well built (with a few exceptions we'll get to in a moment) and feels solid in the hand. With a 4.3-inch display, the Inspire 4G may be a tad too solid at 5.78 ounces and 0.46 inches thick. Available in black, red or rich chocolate brown (the model we reviewed), the HTC Inspire 4G would seem ready-made for AT&T's HSPA+ network, promising 4G speeds right in its name – but those expecting anywhere near LTE data rates are going to be disappointed. The S-LCD capacitive touchscreen packs in a modest 480x800 pixels with a pixel density around 217ppi, so the display looks higher quality than specs alone might have you believe. Upon closer inspection with the screen off or in direct sunlight, it's easy to spot the touchscreen panel lying underneath the Corning Gorilla Glass, recessed into a sturdy, single-color unibody aluminum frame of your choosing. In normal use, however, we didn't notice it. On the back, the familiar AT&T branding is silkscreened underneath a bulging 8MP camera lens. Seriously, it's so large that the handset lifts a few millimeters up from any hard surface it's placed on, which means it can rock back and forth – and potentially scratch – as a result. The camera lens isn't really stylish or practical; instead, it just kind of gets in the way of an otherwise streamline design. A dual LED flash lies flush to the left of the camera lens, with speaker to the right. HTC boasts Dolby Mobile and SRS Wow HD audio enhancements (which are also silkscreened onto the back as a reminder), but the tiny rear loudspeaker sounds just as tinny and shrill as every other smartphone without them. Perhaps a bigger sin than the Cyclopsian lens is the ridiculously complicated battery door on the left side of the device, which shows us yet again that sometimes companies build better products by just sealing the batteries. This rectangular door sits below the volume rocker with a notch for popping it open with a fingernail – or at least that's the idea, anyway. Once you've done this, fear washes over you as the opposite side of the door remains stuck until you force it – which we were hesitant to do at first, for fear of breaking the review unit. Once removed, the battery slides out with no trouble, but replacing the cover may be even more daunting than removing it in the first place. Likewise, the bottom of the unit (featuring the Dolby and SRS logos) slides off – which will probably take you a couple of good tries with both thumbs and a firm grip – to reveal the standard-sized SIM card and included 8GB micro-SD card, which can be replaced with up to 32GB. In one final design faux pas, once this plastic cover is slid back into place, it refuses to sit flush with the unibody frame – which is sure to vex any obsessive-compulsive types who own one. Atop the Inspire 4G is a recessed power/sleep button on the left side; it's occasionally hard to get your finger on and honestly, we wish it were on the opposite side. At bottom is a micro-USB 2.0 port and 3.5mm headphone jack; the right side of the device is completely devoid of buttons or ports. 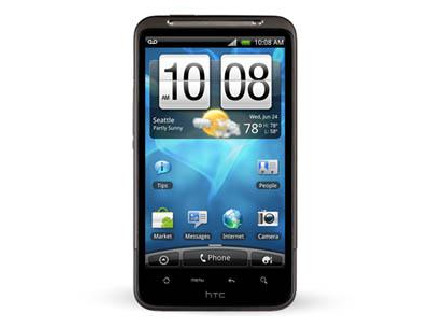 The HTC Inspire 4G is available from AT&T for a wallet-friendly $49.99 with two-year contract, or $399.99 with no commitment.